Inspect the doctor blade holder for damages. Dents, nicks or bends make the doctor blade setup wavy. Make sure it’s clean inside the clamping area. Use a counter/support blade from 0,5mm thickness, preferably a stainless type. Cut the counter/support blade at ends to 45 degree angle. (To reduce wear from printing cylinder ends). Make sure the doctor blade is mounted straight in holder, so no waviness is observed. Check along the blade from the side. When bolts/screws are used for clamping blade holder, tighten from center bolt/screw and outwards crosswise. Use a torque-wrench if possible. Check so all treads are OK and that no bolts/screws are missing. Use measuring tape or other precise measuring tool for setup of blade extensions. (Preferably use fixed end-stops/pins in bottom of the blade holder clamping area). Counter/support blade 20mm and doctor blade 4mm (+-1mm. If necessary increase or decrease extensions to find the optimum for your machine). 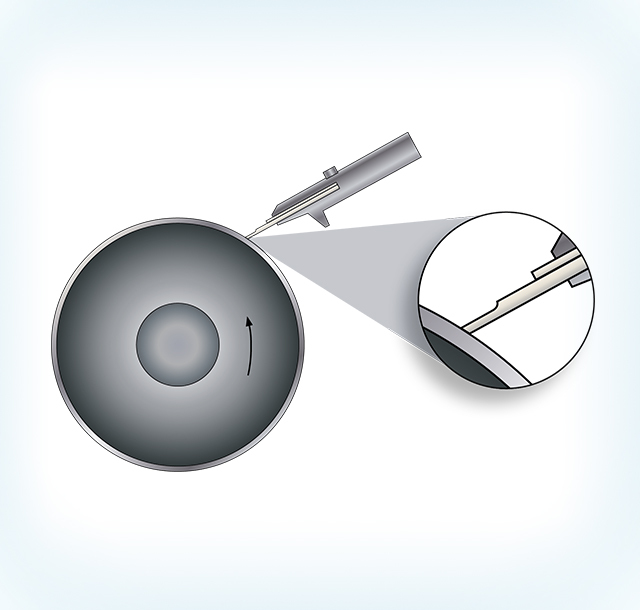 Check doctor blade edge for damages by lightly running your finger nail along the blade edge. Be careful, it’s sharp! Attach the doctor blade holder securely to machine. 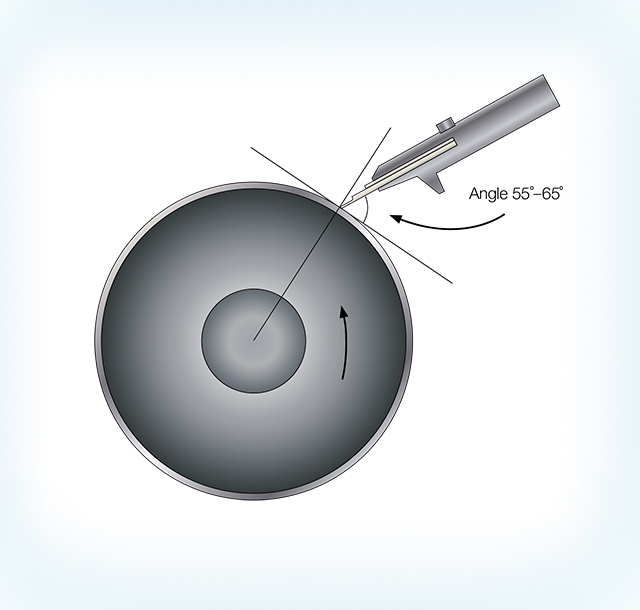 Try to achieve a 55-65 degree contact angle between doctor blade and cylinder (less doctor blade pressure is needed). Use a blade pressure of 0,5-1,0 bar, increase more if there is no clean wipe, but try to use as low blade pressure as possible. (Less blade flex and blade/cylinder wear). Set blade oscillation to 20-25mm. If your machine doesn’t allow that long stroke, use the max stroke length. Make sure oscillation stroke is smooth. No jerks or stops. If there is a need to use a slur-stick, use one with a very sharp tip. Then only low pressure force is needed. Recommended is to use a round wooden stick that can fit into a pencil sharpener for re-sharpening.